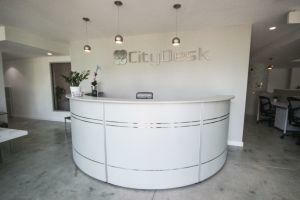 A MODERN WORKSPACE COMMUNITY FOR START-UPS, ENTREPRENEURS AND CREATIVE PROFESSIONALS. Choose from multiple and completely unique all inclusive designs. Enjoy the privacy and space of your own office for multiple people or individuals with 24/7 secured access. Have your own personal dedicated or shared co-working desk. Create your own work station with your own personal items as well as access to your personal cabinet locker. Available in different styles. Plan your meetings in our high tech conference room with large LED Smart TVs’, white boards, Skype video and conferencing calling… All with our super comfortable ergonomic chairs! With our virtual office, your business can be permanently based at our space even though you’re not. Our team will ensure that your calls and mail are handled in a professional manner so that you’re always connected wherever you may be. Receptionist, phone and mail handling service. Call forwarding, voice mail and conference calling. Complimentary coffee and tea is offered regularly. Our conference room is reserved with an online scheduling system making is easy to book meetings. 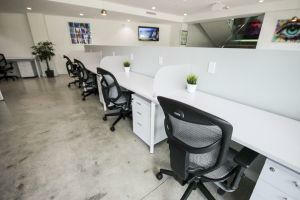 Our offices come ergonomic and fully furnished. 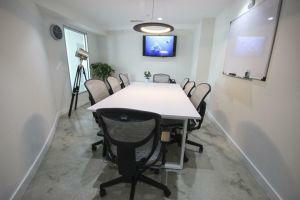 High tech conference room with large LED Smart TV and call in conference phones. Multi function printer and scanner. We offer flexible terms and rates. Easy Parking & Valet options. We provide the products and services so you can focus on what’s important, making a living. High Tech on-the-go Meeting Room so you can have your meetings in a professional environment and not have to worry about the details.